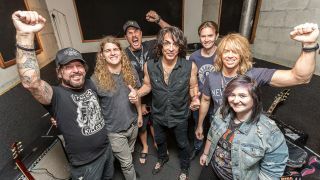 In addition to celebrity counsellors like Jeff Scott Soto, Rudy Sarzo and Vinny Appice, the first of two camps in Los Angeles this summer featured two Rock and Roll Hall of Fame inductees as its headliners: Kiss co-founder Paul Stanley and former Eagles guitarist Don Felder. After two days of practice, master classes and jam sessions, approximately four dozen participants would have the opportunity to perform a song with Felder and then jam twice with Stanley – first in a rehearsal room, and then on stage at Hollywood’s famed Whisky A Go-Go nightclub. Prior to attending, I had only a passing knowledge of the Fantasy Camp, whose previous instalments have been top-lined by the likes of Brian Wilson, Steven Tyler and Slash. I’m curious to learn more, but there’s one potential snag: I haven’t played guitar in years. After I explain this I’m told I’ll be assigned to the “beginner’s camp,” which will be counseled by Tracii Guns – as in L.A. Guns and, once upon a time, Guns N’ Roses. No pressure, right? I begin to wonder what I’ve gotten myself into. Suddenly, my rock fantasy has become quite real, and I’m completely unprepared. Maybe playing guitar will be like riding a bike, but as I practice that night, I quickly realise it’s more like trying to remember a foreign language you haven’t spoken since grade school. Unfortunately, I’m anything but fluent – which is to say, I sound terrible. I arrive at North Hollywood’s Amp Rehearsal Studio, where I’ll spend much of the next 72 hours. The two-story facility has more than a dozen practice rooms, and I head toward Studio D to meet Tracii, who’s teaching a master class called “Connecting The Dots – Solo Phrasing.” To my relief, it’s more philosophical than instructional, with Tracii emphasising the importance of finding your own voice as a player. “You’ll never one-up someone who has their own personality,” he says. “You can only be yourself.” At one point, Bruce Kulick – who isn’t advertised to appear, but who has served as a camp counsellor in the past – pops in, and I realise what a strange rabbit hole I’ve tumbled down. Looking around, I see a mix of middle-aged guys and teens with their parents in tow. The same holds true for my beginners’ band, which includes Megan, a 16-year-old from Dallas who started playing guitar last year. Then there’s Patrick, a shaggy-haired fitness trainer from San Diego who is attending his fourth camp – but his first as a guitarist. Three additional band members will arrive tomorrow. Since we don’t have a drummer, Shane Fitzgibbon, who plays and tours with Tracii, joins us behind the kit. From there, we go to an orientation session, where we meet Rock Camp founder/producer David Fishof. He welcomes us and says camp attendees this weekend include a U.S. Marine, a pilot and a private eye, as well as someone who came all the way from Australia to participate. He also tells us we’re to prepare two 10- to 12-minute sets, and that we need to come up with a band name by the following afternoon. Afterward, we return to Studio D for our initial jam session. The first order of the day is learning Take It Easy, the song we’ll play with Felder on Saturday. As beginners, we sound just as bad as you’d expect, but Shane (who sings the song, sounding great in the process) and Tracii display the patience of saints, always staying positive and encouraging me, Patrick and Megan as we go through take after take. When someone says it’s time for dinner, I’m shocked to learn we’ve been playing for three hours. On Friday, we move into a larger rehearsal room in anticipation of the arrival of our final band members – British comedian Russell Howard and his mother Ninette, who are filming an Americana-themed television show for Comedy Central. This particular episode will apparently showcase how quickly they can learn the guitar (Russell) and bass (Ninette) parts for Take It Easy with no prior musical training. We’re also joined by Matt, a student in Soto’s vocal camp. In addition to being a singer, Matt is a professional wrestler, structural engineer and television sports commentator – a true Renaissance man for modern times. Soto gives him a few pointers on vocal harmonies before heading out to monitor the progress of his other campers. The previous day, we briefly discussed which Kiss song we’d like to play. At first, Tracii suggested I Love It Loud, but we manage to convince him to do War Machine instead. Today, we’ll start learning the song in earnest, but the primary focus of the morning rehearsal session is Take It Easy. Ninette, who has never played bass in her life, borrows one from Sarzo and says it’s easier for her to push down on the strings with her thumb rather than her fingers, which quickly earns her the nickname “Thumbs McGhee.” I scribble an entry-level tablature for her to follow along with and we run through the song numerous times. Soon after, two days before his scheduled appearance, Stanley pays us a surprise visit. First, he watches us limp through Take It Easy. The sense of role reversal is surreal, as someone I’ve seen perform a least two dozen times over the past 25 years watches and listens to me instead. It’s even more surreal when he borrows Patrick’s guitar and joins us for another pass of the song, adding backing vocal harmonies with Matt during the chorus. After he leaves, I’m stunned. Did that just happen? From there, we begin to discuss potential band names. As a potty-mouth, I’m fond of the triple-entendre “Guns Nuts,” but alas, I’m the only one. Eventually, I suggest a jumbled word I’ve used on and off over the years – Fustercluck. Everyone loves it, and we go back to rehearsing. Once again, the afternoon races by. After dinner, we finally start work on our third song – Wild Thing. Shane listens to the song a few times on his phone and then maps it out for us, and as we run through it, he hilariously vocalises the song’s flute solo, which he’ll continue to do throughout the rest of camp. (Ron Burgundy, eat your heart out.) After an hour or so of practice, I break a string, which makes me feel as close to a real guitarist as I have yet. I can’t wait to wake up and do it all over again tomorrow. We spend Saturday morning working on Wild Thing and War Machine, as Russell and Ninette won’t be joining us until the afternoon. Both songs still need work, but there’s noticeable improvement. My fingers, however, are killing me. I worry about being able to make it through another two days of camp. Felder arrives after lunch and participates in a Q&A session, but I figure I should squeeze in all the practice I can, so I return to the empty Studio D. A few minutes later, in an unexpected highlight of both the day and the entire weekend, Tracii comes in to start working out a solo for “Take It Easy,” as he’s not sure if Felder will want to perform it himself. For the next 45 minutes, I play the solo’s 4-bar chord progression on an endless loop as Tracii experiments with different lead patterns. To my ears, everything he plays sounds great, but he’s not happy with the way the solo climaxes or resolves, so we do it again – and again, and again, and again. It makes me realise just how much time and work goes into writing even a brief solo passage, and I find it admirable that Tracii is determined to “nail” a lead that isn’t even his. It’s also encouraging to see that even established, career guitarists have to do their homework. With every pass, Tracii gets the solo closer to where he wants it to be. Meanwhile, I’m thrilled that instead of being a third wheel as I feared, I’m actually contributing. I might not be able to solo to save my life, but if I can help someone else do so, there might be room at the table for me yet. Admittedly, it’s also pretty awesome that someone who has been in bands with Axl Rose, Michael Schenker, Rudy Sarzo and Nikki Sixx is jamming with me – and not telling me to bugger off. Soon after, it’s our turn to take the stage with Felder. It’s crowded up there, with Felder, five guitarists (Tracii, Megan, Patrick, Russell and yours truly), Ninette on bass, Matt on vocals and Shane behind the kit, but we manage to make it work. In the end, Felder plays the Take It Easy solo himself, so the fruits of my impromptu jam session with Tracii won’t be heard until later in the evening, when we’ll perform our three songs in public. For now, though, we pass our first major test as a band. Several hours later, we reconvene at Hollywood’s Lucky Strike bowling alley, where a popular weekly jam night takes place. When I see my bandmates, I notice Matt and Megan have changed into sharp outfits, while Patrick is dressed to kill – literally – as the Starchild. Russell, meanwhile, sports a blond wig that makes him look like Vince Neil circa 1984. Of the 11 camper bands, we perform second. When we take the stage, it’s a complete blur. I’m on the different side of the stage as my amplifier and can’t hear my guitar at all, so all I can do is hold on and hope for the best. We play Wild Thing and War Machine before Tracii introduces Russell and “Thumbs,” who join us for Take It Easy. We make it through relatively unscathed, although at some point during the solo – the one part of the entire set I should be able to play in my sleep by now – I realise I’m strumming the wrong chords. I recover quickly enough, but still, I’m disappointed in my mistake. Luckily, there are four other guitarists on stage to cover for me, and the rest of the song goes off without a hitch. Afterward, there are high-fives and smiles all around, Megan’s being the biggest. As for me, I’m guessing I had the stage presence of a mannequin and seemed like a deer in the headlights, but I’ve survived my my first live gig. I then watch the next few campers’ sets before calling it a night. One show down, one to go. For the camp’s final day, we move once again – this time, into a rehearsal room downstairs that’s even smaller than the one in which we started. After we get settled in, we start running through War Machine, as in just a couple of hours, we’ll be joined by Stanley. I’m less nervous than I expected to be, presumably because we’ve already played one song with him. Still, the prospect of jamming with one of your musical heroes is daunting under any circumstances. Once Stanley arrives, he plays the song’s opening riff and we join in right on cue. We might not have a bassist, but our five-guitar wall-of-sound makes the song’s riff downright monstrous. When the song ends, every camper smiles. We’ve passed another major test. Soon, I make the short drive down the Sunset Strip toward the Whisky for the camp’s grand finale. Our set is last tonight, so I have plenty of time to see Stanley jam with other campers. Eventually, I head upstairs to the venue’s backstage area to practice a bit, as we haven’t played Take It Easy today and I want to make sure I don’t flub the chords in the solo section again. After a few minutes, my wife arrives and asks me if I’m nervous. I realise I’m not – just excited. An hour or so later, Fustercluck’s second gig opens once again with Wild Thing. We screw up almost immediately but recover quickly enough that I hope we’re the only ones who realise it. From there, we play Take It Easy together for the first time in more than 24 hours, but surprisingly, it’s our tightest performance of the song yet. I’m especially relieved that I manage to play the correct chords throughout this time. Afterwards, as Stanley heads toward the stage, I approach Matt’s microphone and deliver the line I’ve wanted to say all camp long: “Paul, you wanted the best… but you got us.” From there, he plays the opening riff to War Machine just as he did in our jam room a few hours earlier and we perform the song for one final time. Fuelled by a mixture of nervous energy, adrenalin and — at least in my case — a desire to avoid embarrassing myself in front of both my family and someone who’s written some of my favourite songs of all time (Bang Bang You notwithstanding), it’s probably our best rendition of the track yet. From there, we exit the stage, put our guitars away and start saying heartfelt goodbyes. Fustercluck is dead; long live Fustercluck. I then watch some of the camp counsellor super-jam finale and try to take it all in. I was just on that same stage, I tell myself, but as fun as it was to be on the other side of the fence for a change, I think I prefer the view from where I’m standing. Since camp ended, I’ve tried unsuccessfully to come up with a fitting “moral of the story” – something about conquering your fears, maybe, or that it’s never too late to follow your dreams. Honestly, though, I think Stanley himself said it best: You’ve gotta live like you’re on vacation. For four days, I existed purely for the joy of playing music. In the process, I met some wonderful people, experienced some unforgettable moments and had more concentrated fun than I knew was possible. Perhaps most important, while I can’t promise with any certainty that playing guitar will be a part of my daily life, it’s fair to say that we won’t remain strangers. For more information, visit the Rock ‘N’ Roll Fantasy Camp website. Special thanks to David Fishof, Valerie Ince and the rest of the Rock Camp team for their hospitality.